My photographs have appeared in Popular Science, Sierra, Solar Age, Alternative Sources of Energy, L'Espresso, Air & Space Smithsonian, Windpower Monthly, WindStats, Renewable Energy World, and other magazines, in several engineering and physics textbooks, on brochures and posters published by the National Renewable Energy Laboratory, by Friends of the Earth (UK), by the Union of Concerned Scientists, and the World Wildlife Fund. The following pages include some of the photos from my collection. I have also been collecting cultural icons featuring wind turbines for many years. This too is part of my collection and I add to these pages as time permits. Some of these icons can be found in my books. 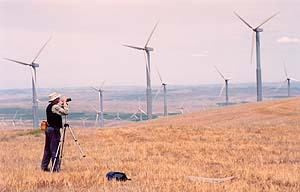 If you are searching for a photo of a particular wind turbine, contact me. Please note, however, that I am a commercial photographer and that I charge for my images.